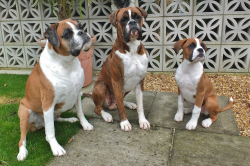 My Name is Doug Jones and we have owned Boxers for over 20 years and Trained our own Dogs through the Kennel Club Puppy Foundation to the Gold Award. As well as Training our own Dogs, I have been directly involved as a Training Instructor and Kennel Club co-ordinator for the Good Citizen Dog Scheme for all levels of Training with a Kennel Club registered Canine Society, having over 300 people achieve awards at all levels over recent years, including over 160 handlers & Dogs successfully passing the Puppy Foundation. I am also a Kennel Club approved examiner for the Good Citizen Bronze Award and passed the examination for the requirements of an Obedience Judge, as well as keeping updated with obedience topics at a number of other relevant Kennel Club Seminars. Our Kennel Club listed Status Dog Training Club started Obedience Training on a Sunday Morning at all levels but due to the demand for Puppy Foundation and Beginners/Bronze Training we now offer these sessions on a Friday evening. Our Training sessions are run by ourselves and Marian & Pete Jackes, covering all levels of the Kennel Club Good Citizens Awards. Marian has previous Training experience with another registered Canine Society and is currently working towards the Kennel Club Accredited Instructors scheme. Each level of Training involves the gradual development of basic exercises included in daily life situations, including the Care and responsibilities required for the ownership of your Dog. All of this takes place in a friendly atmosphere with like minded people, who wish to have a happy responsible family and working relationship with their pets. ​Whilst we conduct a number of Training exercises indoors, having daytime Training sessions, enables us to extend some of the Training to outside situations where appropriate. Duty of person responsible for animal(s) to ensure their welfare. A person commits an offence if he does not take such steps as are reasonable in all the circumstances to ensure that the needs of an animal for which he is responsible are met to the extent required by good practice.